Tourist drivers from North America often encounter unfamiliar things in Aotearoa/New Zealand, such as unsealed mountain roads, roundabouts, and one-lane bridges -- not to mention the fact that we drive on the left side of the road. The bridge type below will be unfamiliar to urban drivers: it denotes a shared rail/road bridge. 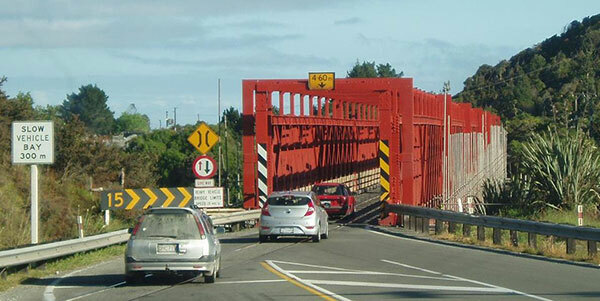 This picture shows the recently repainted bridge over the Taramakau on the West Coast of NZ's South Island. The road sign below was apparently spotted in NZ in April 2003 by an amused tourist. I noticed this picture on the web via the CBC's Writers & Company Aotearoa New Zealand literature list. Any NZer would know to take this sign very seriously. It depicts an endangered kiwi bird, which is a national icon. A kiwi is an endangered flightless bird indigenous to Aotearoa New Zealand. A Kiwi (usually with a capital K) is a colloquialism for a human being from Aotearoa New Zealand. Either way, A KIWI IS NOT A FRUIT! Ergo, cutting one -- let alone eating one -- would be a local crime or a violation of international endangered species treaties. The thing you eat is called a kiwifruit. Calling a kiwifruit a "kiwi" is like calling a pineapple a "pine" or a strawberry a "straw" - ie, inaccurate. The best way to eat a kiwifruit is to cut it in half with a knife, and then scoop out the yummy insides with a teaspoon. The brown, hairy skin is not supposed to be eaten. Kiwifruit are best when they are slightly soft but not squishy. If you buy an unripe (firm) kiwifruit, which I usually do because they keep well, the quickest way to ripen one naturally is to put it in a paper bag with a cut apple. The kiwifruit is actually indigenous to China. Since other countries than NZ joined the kiwifruit business, the NZ product has been given a makeover and is now called Zespri . The colour of a kiwifruit's insides is green (original version) or golden (Zespri) when ready to eat. Enjoy your scurvy prevention! One delicious source of information is a chemist's view on Kiwi slang - enjoy! Another essential part of Aotearoa (the original name for New Zealand) is the M&amacr;ori language - Te Reo M&amacr;ori. It is one of three official languages of NZ: the others are English and NZ Sign Language. The best extant piece of writing I have yet seen encapsulating modern-day Kiwi identity is New Zealand Dreams, by Witi Ihimaera. Well worth your time to read. There's also this gem by John Clarke (aka Fred Dagg), R.I.P.